[prMac.com] New York, New York - TapDownApps today made available InfoSource v1.0 on the iPhone App Store. 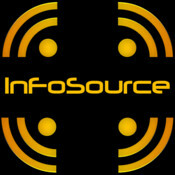 InfoSource is a simple, yet powerful application for monitoring information sources automatically. Simply provide the sources of information to be monitored and InfoSource will check for new items and display them as they become available. InfoSource can actively monitor RSS / ATOM feeds or through the integration of Google search, any topic by providing relevant keywords. Once sources have been added, the item list will automatically update as new information becomes available. New items will be prominently displayed in a dynamic group at the top of the view, then trickle down to the existing items group. InfoSource 1.0 is free and available worldwide exclusively through the App Store in the Utilities category. For additional information about InfoSource including screenshots please visit TapDownApps online. TapDownApps is focused on the development of applications for modern mobile platforms. Currently their development efforts are directed towards the iOS platform and devices such as the iPhone, iPad and iPod touch. Future development projects are likely to expand to other platforms as well. Copyright (C) 2011 TapDownApps. All Rights Reserved. Apple, the Apple logo, iPhone, iPod and iPad are registered trademarks of Apple Inc. in the U.S. and/or other countries.